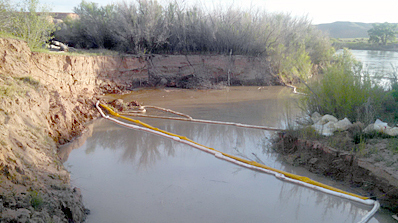 An oil well blowout during the evening of May 20, 2014, leaked an estimated 100 barrels per hour of crude oil and production water into a dry wash leading to the Green River. The Department of Environmental Quality (DEQ) consulted with members of the Unified Command on the scene as State and federal agencies worked with the operator to control the leak, contain and recover the spilled material, and assess the impacts from the spill. DEQ Division of Water Quality (DWQ) staff visited the spill site twice to take water samples and assess the cleanup efforts. An unusual storm event several days after the well blowout washed contamination into the Green River. DWQ samples taken several hours after the rainfall event did not show hydrocarbons present in the river. Cleanup has progressed rapidly and should be complete in 7-10 days. The Utah Division of Oil, Gas, and Mining (DOGM) will be overseeing day-to-day activity on the site. The Environmental Protection Agency (EPA) is scheduled to return to the site on June 3, 2014 to walk the area with the Bureau of Land Management (BLM), representatives from the Unified Command, and environmental contractor Custom Environmental Service (CES) to review final cleanup measures and transition the site from emergency response (EPA as lead) to final cleanup and closure (DOGM and BLM as leads, with input from DWQ). The majority of cleanup in the immediate vicinity of the pad is complete. Additional cleanup will include the removal and disposal of contaminated soil and vegetation from the temporary containment pad constructed to collect this debris. Since considerable portions of the drainage are not accessible by mechanical equipment, much of that area will have to be cleaned by hand. 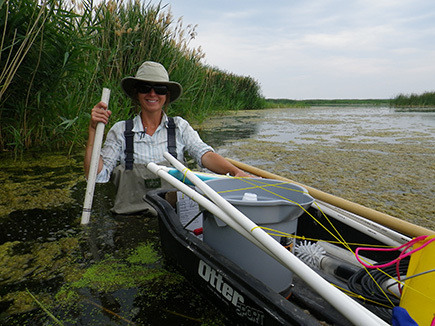 Analytical test results (434 KB) from the sampling on May 24, 2014, did not show any hydrocarbons present in the Green River or in the confluence area of Salt Wash as it flows into the Green River. A formal Unified Command, made up of representatives from the BLM, DOGM, EPA, CES, and SW Energy, began meeting each morning and evening to coordinate cleanup strategies. DWQ was kept updated on conditions at the spill site. DWQ staff visited the site in response to reports that contaminated water may have reached the Green River following a heavy rain. DWQ was able to sample the river several hours after the storm. The containment dams at the well pad were not affected by the storm, and contaminated water in the containment ponds had already been removed and disposed of at Danish Flats before the storm. SW Energy retained Custom Environmental Services (CES) to clean up the spill. BLM is providing oversight of the cleanup and DOGM is providing technical assistance. Two underflow containment dams—one at the well pad and another located near the Green River—were put in place. Hard booms were positioned throughout the dry river bed and in the calm water at the confluence of the wash with the Green River to prevent contaminated water from flowing into the river. DWQ took samples (437 KB) in the Green River above the confluence with Salt Wash to establish background levels in the Green River No produced water or oil had reached the Green River as of this date. An oil production well owned and operated by SW Energy blew out during the night of May 20, 2014, and began leaking crude oil and production water into a dry wash at the well site. SW Energy, operator of the well, took action to contain the release at the well pad and reduce the potential release to the Green River. Two ponds were built 300 feet from the well to capture the fluids. Crews pumped out the ponds into holding tanks near the site and took additional fluids to Danish Flats. Equipment arrived at 6 p.m. to kill the well and stop the flow.